Click Here to see all the artists who have been featured in our pages. Doll Castle News’ publisher Castle Press Publications can be reached via mail at Doll Castle News, P.O. Box 601, Broadway, NJ 08808, email at info@dollcastlemagazine.com, or via phone at (908) 362-9997. We look forward to hearing from you. 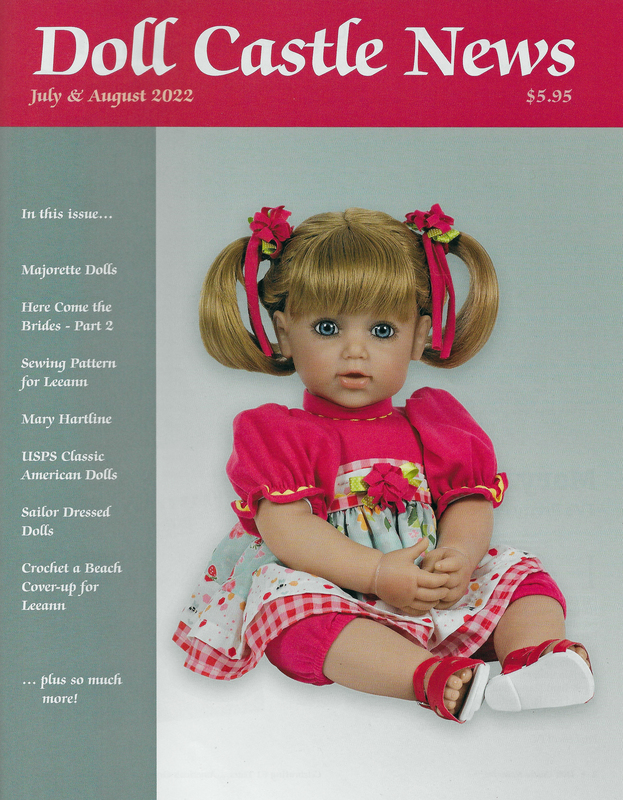 Doll Castle News is a bi-monthly magazine serving the general interests of the doll and miniature collector. Professionally printed, each issue contains interesting and informative articles on all types of dolls and related items, museums and places of interest pertaining to doll collecting, a doll identification and value column, a paper doll section featuring a full-color original paper doll by a current artist, needlework and doll clothes patterns, book reviews, news of what is currently available in the doll world, a dealer directory, a doll show calendar providing dates of events across the country, contacts for dolls, accessories and supplies, and much, much more. Doll Castle News has been published continuously since 1961 by the Mueller family in New Jersey, all the while other doll publications have come and gone. Doll Castle News is 8 ?” x 11” in size, and contains 48 pages of text, photos and illustrations per issue. The magazine carries limited advertising, leaving much more for the subscriber to read. More than twenty columns and feature articles appear in each issue, written by fellow collectors and well respected authorities in the doll world. Doll Castle News is America’s oldest publication for the doll and miniature collector and is proudly printed in the U.S.A.
© Doll Castle News, All rights reserved. Another Doll Castle News Issue ... too good to miss!